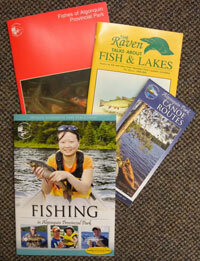 Purchase Algonquin Fishes, Fishing in Algonquin, The Raven Talks About Fish and Lakes and the Algonquin Park Canoe Routes Map together, by ordering Set #2, and SAVE. Algonquin Provincial Park is renowned for some of the finest fishing in Ontario. It has hundreds of clear, cold lakes which are ideal for trout. Many a fine day in the Park has been topped off with a delicious meal cooked over an open fire in beautiful wild surroundings. Many visitors come to the Park with little or no idea of how to fish, where to fish, or even the kinds of fish that might be expected. The results of this approach are predictably disappointing and it is the purpose of this book to give you the knowledge that may make the difference between success and failure. 32 pages. Dan Strickland. 2014 (8th revised edition). Fishes of Algonquin Provincial Park introduces readers to the 53 currently occuring Park fish species with over 70 outstanding coloured photos of live fish. Written by Dr. Nick Mandrak who conducted the definitive study of Park fishes in the 1990's, and his mentor E.J. Crossman of the Royal Ontario Museum, this book breaks new ground in helping a wider audience get to know and appreciate the fish fauna of a major Canadian park. 40 pages. Nick Mandrak & E.J. Crossman. 2003. This map contains all the necessary information required by Algonquin Park's backcountry canoeists. This map shows lakes, campsites, portages, access points, plus natural and cultural history features. The reverse side of the map provides detailed information about planning your Algonquin Park backcountry adventure including park management messages, safety information, equipment requirements, etc. 2019/20. The third book in our series featuring excerpts from our popular Park newsletter, The Raven, this book complements the previous two books covering wolves, and deer and moose. Whether you are an angler, naturalist, teacher, or just interested in a good read, The Raven talks about Fish and Lakes will be a great resource. 56 pages. softcover. 2004. All prices are in Canadian dollars. All algonquinpark.on.ca prices are applicable to online purchases only. HST (5-15% depending on the Province) will be applied to all orders shipped to addresses in Canada. The exception are items marked with a ** which are only taxed at 5%.